The most ambitious Zelda title yet is set to get its own batch of DLC bundled up in a season pass starting from launch of The Legend of Zelda: Breath of the Wild on the March 3. Players should expect to put down $19.99USD/$30AUS to purchase the additional content in the season pass. As a bonus, any purchases of the DLC season pass will get a special pack available starting from launch day which includes three new treasure chests that appear in the Great Plateau area. Two of the chests will contain “something useful”, however the third contains an in-game Nintendo Switch t-shirt that Link can wear. The first DLC pack releasing midyear contains the Cave of Trials challenge, a new hard mode and a new feature for the in-game map. A final DLC pack will be available in the holiday season giving players new challenges with an additional dungeon and a new original story. At this stage Nintendo has only announced two DLC packs which will be part of the season pass, it us unknown if Nintendo plans further DLC down the track but already the announced DLC will offer players some unique experiences in the world of Breath of the Wild. For players not picking up a Nintendo Switch the same offerings will be available on the Nintendo Wii U system. Sekai Project first announced that it was localising the visual novel Fatal Twelve back in August 2016. Is it another Danganronpa clone? Now Aiueo Kompany has launched the first teaser trailer — and it is very much 90 per cent teaser — announcing an autumn 2017 release for PC. The little we can see of the artwork looks detailed and promising, and the intimated dark story premise sounds intriguing too. Twelve individuals are forced to participate in “The Choice of the Goddess” to get another chance at life. However, only one of the twelve can survive and the only way to do so is to figure out the name, cause of death, and regret of the other eleven individuals. This sounds less like a Death game and much more like a ... life game. We hope it will bring a refreshing new slant to the popular elimination sub-genre. The official website has also been opened but so far consists only of a countdown timer, recording 28 days to go from time of publishing. 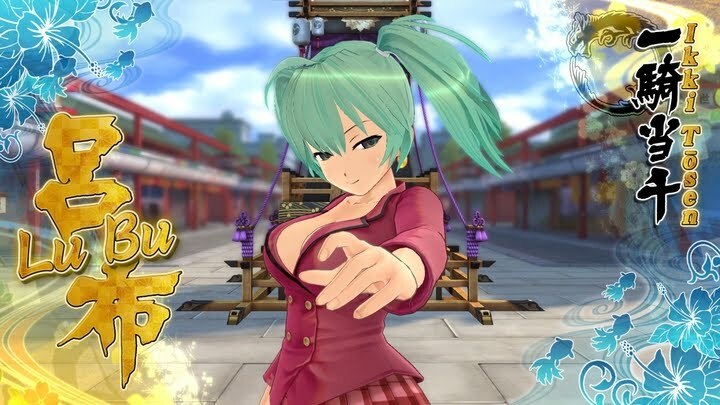 Senran Kagura: Estival Versus was released for PlayStation 4 and PS Vita in last March, and now it is finally coming to PC via Steam next month. XSEED also announced that it will simultaneously release the long-awaited crossover DLC pack featuring characters from the Battle Vixens (Ikki Tousen) manga and anime series for all platforms (PlayStation 4, PS Vita, and PC). The pack adds Sun Ce, Lu Bu, and Guan Yu as playable characters. The PC version will also support the 10-player online multiplayer that is available on the PS4. Developer Games Farm and publisher Kalypso Media announced that its action RPG Vikings – Wolves of Midgard will arrive on PlayStation 4, Xbox One, PC/Mac on March 28. “... A combat-focused action RPG set in the shadow of Ragnarok — the end of days. When the Jotan begin to unite the Fire and Frost Giants under their flag in preparation for their march on Asgard, they cross paths with an outcast clan of Vikings called the Ulfung, the Wolf Clan. You arrive from the winter hunts to find your village in ruins and under attack from the Jotun. The old chieftain lies dead in the aftermath of the conflict and only a handful of survivors remain, leaving you to rebuild your home while fighting against the forces of evil that would doom the nine realms to oblivion." Your fully customisable Viking warrior or shieldmaiden nerds to master several weapon styles and magical abilities. Combat styles include sword and shield, two-handed hammer, staff, bow, and dual axes. The game has an in-depth crafting system for upgrading your equipment, using collected resources and special runes. Apart from items and resources, the other key resource is blood, used to level up and earn gift points to unlock special powers called Gifts of the Gods. As you'd expect for Viking warriors, their vital ability is Rage mode, and this too is upgradeable. The game features an interesting “Exposure System,” which refers to hazardous enviroments; these cause detrimental (status) effects and only safe zones can protect and revitalise the player. Nagby confirmed that the game will include two-player online co-op as well as a New Game+ mode. There is also The Trials of the Gods, “a boss wave mode" where you can earn extra special rewards.